Born in Bisceglie, Mauro Giuliani's centre of Study was Barletta where he moved with his brother Nicola in his early childhood. He studied cello and probably violin, the former which he never fully abandoned. Subsequently he devoted himself to the six-string guitar, rapidly coming to be renowned as a skilled performer on the instrument. The teachers and movements of the young maestro are not known. Married to Maria Guiseppe del Monaco, they bore their first child Michael in 1801, in Barletta. By age 25 years Giuliani, like many skilled guitarists frustrated by a public's fawning of opera, and neglect of the guitar, moved north to Vienna, Austria, without his young family. Here he began a relationship with a Fraulein Willmuth, with whom he had a daughter Maria, in 1807. In the Austrian capital Giuliani competed with local talents such Simon Molitor and Alois Wolf, and became acquainted with the classical instrumental styles. Within a year he was publishing compositions in this style, followed by concert tours all over Europe. He achieved great success and was broadly regarded as a musical celebrity, acclaimed for his skills and taste. 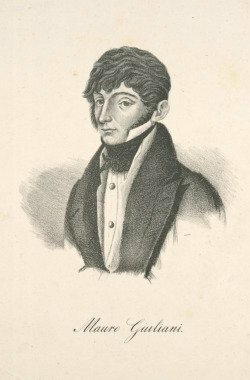 By 1808 Mauro Giuliani was at the forefront of defining a new role for the guitar in the classical guitar movement in Vienna. The premiere of his Guitar concerto (op.30) with full orchestral accompaniment was received with great public acclaim. He moved in the high social circles, was acquainted with the likes of Rossini and Beethoven, and collaborated with best performers. Indeed he performed in the orchestra on the premiere of Beethoven's 7th symphony, probably on the cello. In the botanical gardens of the Schonbrunn Palace he acquired further prominence through a series of concerts in 1815, called the "Dukaten Concerte" named the price a ticket, which was one Ducat. In the same year he was invited as the official concert artist for the celebrations of the congress of Vienna. Additionally, in 1814, he held a position of 'virtuoso ororario di camera' to Empress Marie-Louise, Napoleon's second wife. In 1819 Giuliani was living with serious debt, his property and bank accounts were seized, and he opted to depart Vienna, and return to Italy - initially Trieste and Venice before settling in Rome. He brought with him his daughters Emilia and Maria, who were educated at the nunnery L'adorazione del Gesu. In the Italian capital Giuliani found little success, publishing only a few compositions and giving one concert. Giuliani's father health deteriorated and he began a series of trips to Naples to be with him in 1823. 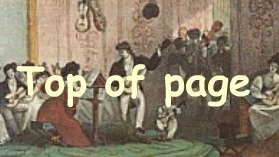 He found a better reception for his artistry in this Bourbon city, and published works for guitar with local publishers. 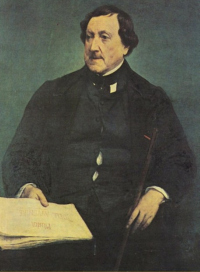 In 1826 he performed in Portici before Francesco I and the Bourbon court. Emilia was an accomplished guitarist herself, and the father and daughter appeared frequently in duo concert. Mauro Giuliani's health began to fail in 1827, and he died two years later on the 8th of May. Giuliani employed the treble clef to notate guitar music. With melody, bass and inner voices all distinguished through the careful use of stems and rests. 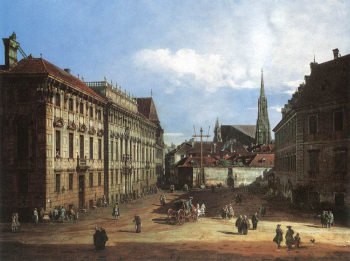 A popular musical form in Vienna was 'theme and variations', which he particularly excelled at. An example of this being Variations of a theme by Handel Op.107 - a popular theme known as 'The Harmonious Blacksmith'. Giuliani's works for guitar constitute the nucleus of nineteenth-century guitar repertory - 150 of these are with opus numbers. Amongst these works are challenging pieces for solo guitar, orchestra and duets for guitar partnered with flute or violin. A Guitar Method was also authored by him. Grand Overture for Guitar Transcription of the Overture to The Barber of Seville. Today Giuliani's works are widely performed by professionals and amateurs alike.